I don’t think it’s too much of a stretch to say that this was one of the most significant years for Japanese role-playing games in recent history, first and foremost because one of this fall’s biggest games was a brand new Final Fantasy. This piece was originally published on December 24, 2016. Final Fantasy XV turned out to be one of the most interesting games of the year, standing out among a crowded slate of shooters and open worlds. Is it disjointed? Absolutely. Does it feel unfinished? Yep. But Noctis and crew still managed to resonate with thousands upon thousands of JRPG fans, offering a unique road trip with a rhythm unlike any other open world game out there. Mario & Luigi: Paper Jam - A generally forgettable entry in the Mario & Luigi series that will hopefully convince Nintendo to reimagine their idea of what makes for a good Mario RPG. Paper Jam is a ton of fun to play (and super clever) but not nearly as iconic as, say, Thousand Year Door. Adventures of Mana - Great remake of Final Fantasy Adventure that I’d recommend to just about anyone. Bravely Second: End Layer - Kinda disappointing. Where Bravely Default felt like a fresh take on traditional turn-based RPGs, its sequel doesn’t live up at all. Bravely Second is too repetitive and reuses way too many of Bravely Default’s ideas—the bad ones, too. Dragon Quest VII - I’ve played around 15 hours of Dragon Quest VII, which means I’m roughly 5% through the game. Very good RPG. I Am Setsuna - Gloomy and monotonous, but charming. 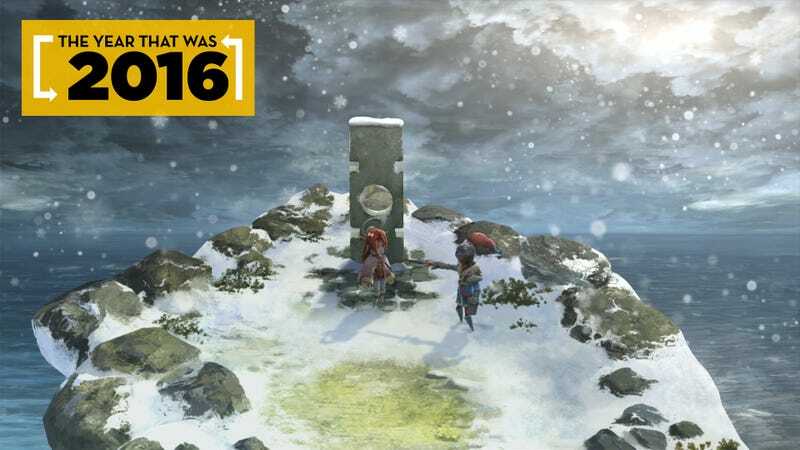 Although it’s easy to tell that this is a budget JRPG, designed by a very small team of Chrono Trigger fans, I Am Setsuna still achieved what it set out to do. Shin Megami Tensei IV: Apocalypse - Yet another solid Shin Megami Tensei dungeon-crawler. Nice appetizer to prepare for Persona 5. The Legend of Heroes: Cold Steel II - Came out at the worst possible time for me, so I haven’t played more than a couple of hours yet, but I will finish this game by next year. The first Cold Steel is great. Final Fantasy Explorers - I forgot that this game existed. World of Final Fantasy - Haven’t played much of this one, but from what I have seen, it seems excellent, like a cross between Kingdom Hearts and Pokemon. Fahey loves it. Final Fantasy XV - Greater than the sum of its parts. Final Fantasy XV might be a mess, but it’s a tremendous mess. Dragon Quest Builders - A lock for game of the year. Like Minecraft, but better. I probably should have played Tokyo Mirage Sessions, which I hear is excellent, but I think my Wii U stopped working. (Not like I’d even notice?) Hopefully Nintendo ports it to the Switch. A pretty good year for JRPGs, don’t you think?